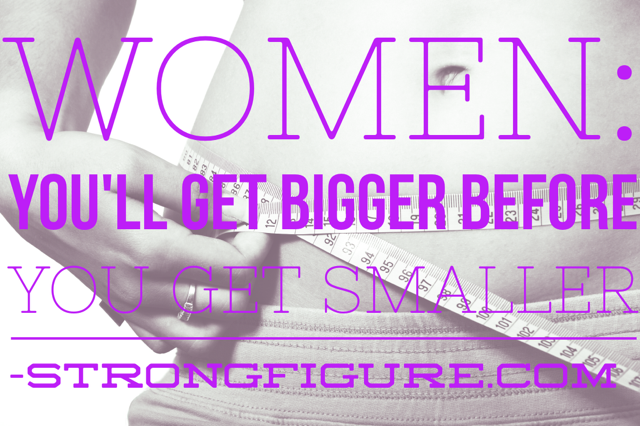 When we published our currently top trending article, “Women, You’ll Get Bigger Before You Get Smaller” back in October, we never expected to get as many questions and comments on the post as we are continuously getting to this date. Since we published it, the questions we’ve received have allowed us to not only go back and add more valuable information to the post, but it has also helped us figure out our audience a bit more and ultimately be able to provide answers that many people (women especially) are searching for. The awesome thing that I see here is that most women do know and understand that they need to lift weights. Even those who have done nothing but cardio their whole lives are jumping on the barbell bandwagon. That is GREAT. But what’s not great is that while knowing weight training is important, most women are either scared of doing it or just unsure on how to go about it. About a month ago, I developed the MH6 Protocol: six weeks worth of six-minute HIIT workouts to add to the end of a strength training routine. The program was designed to help burn an additional 200 calories per day in order to boost fat loss without having to suffer through a calorie deficit, or AKA, a diet. We at Strongfigure believe in eating as much food possible while lifting heavy and performing interval conditioning workouts. This is the key to optimal fitness: strong and fast, fueled by foods–not diets. The program was a HIT. Or should I say a hiit? 😉 We gave out over 1000+ copies. But we kept getting questions about strength training on our original post. We realized that even though many women were “hiiting” the gym hard (is it still funny? ), most still didn’t quite understand what to do with the weights in their hands. Couple this with the fact that I run into people daily who have NO clue what to do inside a weight room, I knew I had to put together a program that would help. Even most advanced lifters, including yours truly, will try to fix a poor metabolism by out exercising it, which does NOT work. 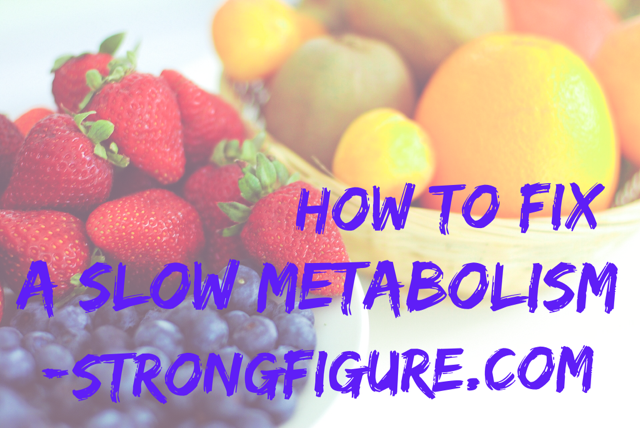 Furthermore, the type of exercise, specific training program, and meeting your macronutrient needs is essential to fixing a stalled or damaged metabolism. Editor’s note: if you are curious how you can get a copy of MH6, we are adding to it, improving it, and we will re-release it in our store in the next few weeks. Strong Figures, I bring you not one or two, but three 12 Week Muscle Building and Fat Loss Training Programs. One for beginners, one for intermediate lifters, and one for more advanced lifters. And the best part of the programs? They’re specifically designed for people who are struggling to recover from metabolic damage (those who ate too little for too long), those who need to eat well and perform the types of lifts to revamp the metabolism so that it begins to burn fat effectively again. Unfortunately, too many of us started a weight loss quest by following bad advice. Cut your calories to 1200, lift for 45 minutes a day, take a group cardio class after lifting, spend an additional 20 minutes on the stair climber, maybe go on a walk with the dog for a couple miles when you get home and whatever you do, do NOT eat a carb. Nope, not one. And we drop five pounds the first week, two the next, .1 the week following, and the next, we gain 3. Is this your story? Maybe I’m over-exaggerating some of it or maybe I’m spot on, but regardless, most of us have screwed up the same way. You see, when we jump into anything too fast–whether it’s a super-strict diet or a crazy hard training program, our hormones say, “Whoa whoa whoa. What’s going on here?” Forget the “Rome wasn’t built in a day” cliche, think about it this way: If you’ve never weight trained before and I put a 250-pound bar on your back and told you to squat it, what would happen if you tried? I think it’s safe to say that you’d fail. No one wakes up and says, “I’m going to be an Olympic high board diver today” and then walks onto the team without a single practice. Do you see where I’m going with this? Fat loss is a slow and steady learning process. It’s not fast and overnight. Any method that promotes speedy fat loss is setting you up for failure. But unfortunately, most of us have tried these failing programs and what happened to us? We screwed up our hormones and now we can’t lose jack sh*t.
Another negative to increasing your exercise is that you’re now at risk for an overuse injury. And even if you’re lucky enough to avoid an injury, you’re extremely likely to burn out and start hating the gym and all exercise. The thing that used to be your escape, your stress relief, your adrenaline pumper, and your endorphin trigger….you now dread. You’ve had enough. It doesn’t work for you so you’re tired of working for it. And now your joints ache to top it all off. When we eat too little and workout too hard, our bodies’ ability to lose fat just stops–no matter how much or how little fat you have to lose. We did it wrong, and we screwed up our insides. Now we’ve got to fix the damage. The metabolic damage, to be exact. So how do you fix it? With the RIGHT exercise. Believe it or not, the type of exercise you do can have a major impact on your ability to burn fat and both gain and preserve muscle. Obviously picking up heavy weights and spending less time on the stair mill helps. But what are you going to do to fix the crappy metabolism that your calorie-cutting and 3-hr-a-day workout screwed up? Our 12 week training programs mix supersets, low-medium-high range repetitions, complex lifts, body-part training, and each day is topped with very short intense intervals. It’s not a CrossFit program, powerlifting program, or even bootcamp style of training. It’s very different. It’s actually a pretty sweet combination of your three big power lifts with bodybuilding-type auxiliary lifting, with an intense conditioning finish to each workout. Sounds like a lot, right? Not really. This is the approach you need to rewire your hormones, boost your slow metabolism, and reignite the fire primed to burning the extra fat. You see, your body is always trying to adapt to stress. Lifting 3 sets of 3 every day at maximum weights is a LOT of stress on the body. Running for miles upon miles upon miles each day is a lot of stress. Spending two hours trying to crush the heaviest weight you can pick up–over and over–puts your body under a lot of stress. And since most of us reading this are in a quest for fat loss, that means we’re probably stressing out our bodies while underfeeding it. Our hormones are shutting off and the end result is a coping mechanism that your body automatically employs: save ALL the fat! He/she is killing us here! With the training programs that we’ve designed here, those looking to maximize fat loss while rewiring hormones and metabolism will be able to safely focus on muscle recomposition and not the constant “I’m under too much stress and I can’t deal with this anymore” mode. Separately, CrossFit style training, strongman, and powerlifting can all be phenomenal training programs and in many ways yield the greatest results for most athletes. And these are the types of training that we typically would recommend to our readers. But all of these styles of lifting are VERY taxing on the body and put the body under tremendous stress. If you are eating correctly and resting correctly then programs like CrossFit or powerlifting will lead to great success. But if you are not taking care of yourself and you are not getting the calories that your body needs to fuel these demanding training regimens then you will likely end up damaging your metabolism and creating a state of hormonal chaos in your body. That’s why we’ve developed a program that is founded upon rebuilding your musculature–not tearing you down and causing unwanted hormonal and physical stress. So how do you fix a broken metabolism? Our 12 week training programs are designed specifically to still help you gain muscle, lose fat, but best of all, FIX your too-slowed metabolism. Our training program is also excellent for preventing metabolic damage for novice lifters who are looking to reap the awesome benefits of resistance training. And if you’re brand new to lifting–that’s great! All the programs are linked to YouTube videos so that you know what to do when you hit the weight room. The beginner’s program starts out with basic exercises and the intermediate and advanced programs take on some challenging yet fun lifts. I promise each program is different, fun, and will change both your appearance AND your metabolism! But PLEASE realize that none of this works unless you EAT properly. We do have a book coming out this summer that will teach you how to properly feed your body, properly train, and much much more. Or if you want custom nutrition coaching please click here. So here is the best part: the three 12 week training programs are absolutely free! All you have to do is be one of us — a Strong Figure subscriber, which by the way, is also free. I know, this keeps getting better and better. And we would love it if you would share us and our articles with your friends! We are all in this struggle together!!! For those of you following my weekly conditioning programming, here are your three Strong Figure Conditioning Workouts for the week. Enjoy–and don’t forget to subscribe and download your new 12 week lifting plan! If you don’t have any equipment to work with, sub 40 lunges for the wall balls, 30 hollow rocks for the swings, and 20 push-ups for the weighted burpees. 200 double unders (immediately after your get-ups) or 300 squat jumps if you don’t have a rope or your double unders yet. 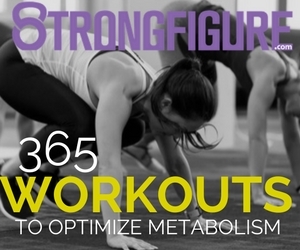 I joined the Strong Figure site and I am trying to find the 12 week workout for fixing a slow metabolism due to my body holding fat. The article, I am getting bigger but working out more, is totally me. Please let me know where to find the workouts to start correcting this. Hey Rhonda! The 12 week-workout program is on the thank you page https://strongfigure.com/thank-you-2/ . If you joined SF prior to Sunday then you were emailed this on May 10 and the subject was “12 Week Muscle Building and Fat Loss Program.” Thanks so much for joining us!! I used to starve myself so bad that my hair was falling out and all i did was run endless miles everyday. I’ve been lifting heavy for three weeks now and eating 1800-2200 cals/day for about five weeks. I only eat non-processed “clean” foods. love lifting and it gives me so much confidence. I also enjoy actually eating real healthy food. I feel better. I also have awesome muscles already and I’m seeing tremendous gains in the gym. However…. I have been feeling HUGE! I can’t fit in anything in my closet! It is so discouraging because I feel healthier and happier but I keep wanting to revert to 1000 calories of sadness and restricting because I used to look so skinny. I would be fine with looking muscly if I had abs instead of flubber but the fat has not come off yet! I can’t button my pants. HELP. WHEN WILL I START BURNING FAT?!?! Just replied to Sam…hope it helps you Abby. Let me know if I can help further! I totally get your frustration. 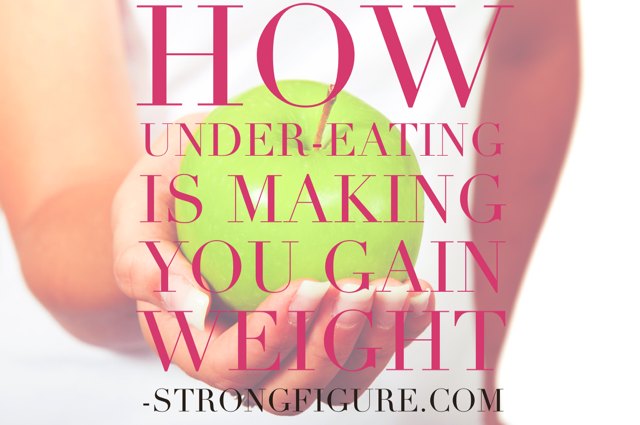 The fact that you used to “starve yourself” means that you’re dealing with metabolic damage. It’s SUPER normal to gain around 10 lbs when you first transition over to weight training and it’s different for every person as far as when that fat will start to shed. Since you’ve undergone some metabolic damage, it “may” be longer for you than others, but do NOT get discouraged. If you revert back to low calorie (trust me, every woman has that urge when they don’t see results) all you’re doing is screwing up that damage even more so and it’ll be much MUCH harder to fix down the road. Continue lifting weights, don’t revert back to “steady cardio and low calories” and I promise you will get there. It could be a couple months, worst case scenario with highly damaged metabolisms, even up to a year. I don’t say that to discourage you, just so you know that this is a slow and steady process. You can’t undue damage in a month, unfortunately. Just think of how long you spent undereating and running those endless miles! This is all one big journey. One thing that could help speed up the process is by adding intense interval training to the end of your lifting sessions. We had actually published a document that contained workouts to help with this process but we took it down to re-format it and add more to it. Make sure you’ve subscribed to our site so that when we re-release it, you’ll know about it. Also, if you’d like me to take a look at your macro breakdown and maybe help make some suggestions on your protein/fat/carb ratios, I’d be glad to help. Check out my coaching page–you may really benefit from option 1. I hope this helps…please let me know what more I can do. Remember: be patient and enjoy the journey! It’s a big learning experience and if you pay attention to your body, you might be able to help and inspire a lot of women going through the same thing! First, thank you for writing these amazing articles- they are truly helping me stay motivated. i can’t tell you how many times I am told that lifting will make me bulky and manly looking. I started training after I was told that I am skinny fat after a body comp test that told me I needed to loose 12 lbs fat and put on 6 of muscle. My(5’4, 133lbs- athletic build) issues is that I have been weight training for 5 weeks now, I can squat 100, press 90, abduct/abductor thighs at around 50. My arms are sad little shrimps that can now do 22 on triceps, (i started at 10) and back is around 60 (lat pull down) and I can row 50. Since starting I have gained an inch around my waist, I definitely do NOT look smaller but I am stronger, my legs look great and now I can flex and see back and arm muscles. The overall looking bigger still brings ‘told you so’ comments from people who advised me to never lift. I also get 3 hours of yoga/week, and 15 mins of HIIT stepper cardio after which i feel completely spent- im working on going for longer. SO: Would you have a guesstimate timeline as to when the conversion happens- from that initial increase in size to finally seeing results? I get 90/100 g of protein daily, carbs at 140 and fat around 50 daily putting me around 1400 cal a day. Hey Radhika! This is so inspiring to hear–it makes me so happy you’re loving the posts! You are doing everything right…just keep lifting heavy heavy weights!! 😀 Honestly, it’s SO hard to throw out an estimate on when you’ll see that fat to fab conversion. With some people it’s been a couple of months, and I’ve even seen many take up to year–but those were people suffering pretty bad metabolic damage. If I were you, I’d think about upping your protein another 10-20 grams, add no more than 2-3 interval conditioning workouts to your training (at no more than 6-15 minutes per session max) and you should start seeing better results. Also, if you ever feel hungry, make sure you’re not undereating…at 133 lbs, you’re looking at a maintenance caloric intake of around 1600 minimum. I know you’re working to get leaner but if I were you, I wouldn’t go too much under that. Hope this helps! Steph!!!! You are a rockstar for responding!! thank you 🙂 I love pushing to see how much more I can lift. I just had my mother tell me that I look bulky yet again, but I totally believe that my conversion is coming soon. Parts of me (like my lower back) are smaller and firmer, so I have a sign of hope 🙂 with clothes I look OK, but my midsection and back hold on to weight, so I know that the muscle is building faster than the 12 lbs of extra fat is coming off. I read this article and the “Women: You’ll Get Bigger Before Getting Smaller”. I have to say reading both these plus the responses below has been EYE OPENING. I am 26, 5’1″ and went from 117lbs to 135, back down to 120, then down to 115 and then 109 within 3 -4 years. And most recently went from 109 to 115lbs within a matter of months. I went from being pretty well informed in things like paleo, hiit, dabbling a bit in weight lifting and really did make some great changes to the way I ate. But seeing my progress ESPECIALLY when I saw what calorie restriction did turned into an obsession. I stopped exercising and instead, basically starved on the week days, and ate everything/anything on the weekends and throwing it all up. It was nuts. I was miserable. I couldn’t eat without having this overwhelming fear of weight gain. Also my bowel movement was whack. Probably went once a week–if that. This way of eating went on for a year in order to maintain the lower weight. A few months ago I decided to commit in treating my body right inside and out. But those bad habits of binging over the weekends and using “cheat meals” as an excuse to completely overindulge has been really hard to control. I find myself still over eating and this time I know purging is NOT an option so I have gained weight through that. I know it’s a process. Now, I have started to work out again and at first I did a month straight of barre. Didn’t do too much physically and I stayed the same weight so I figured I needed more calorie burning workouts if I wanted to see faster change. For the past 2.5 weeks have been doing 5 cardio hiit/spinning classes a week with a yoga/pilates class thrown in. Similar to others, I have GAINED even more weight and can definitely see it physically. I mean it wasn’t like this when I was doing barre. I am actually kind of shocked to see such a physical difference 🙁 . I mean, I already gained weight to begin with, now I’m exercising and am literally getting bigger instead of smaller. My legs are pretty swollen (not sore, like actually swollen) right after a workout and I have never experienced this kind of rapid physical change before. It makes me feel so discouraged and paranoid. But after reading the posts, and comparing it to my own history of food and exercising I gotta say it really is just a healing the body and time thing. I know staying consistent is important and even if nothing changes physically I just want to be at a place where I am eating well and not using food as a way to literally stuff my feelings. Thanks so much for all this information it has been so helpful and encouraging. Thanks so much for your comment–it was so heartwarming to wake up this morning and see that what we’ve put together here, combined with so many others’ comments, input, and struggles, have helped make a difference for you! I am beyond happy that you have decided to turn things around for yourself…there’s no greater gift you can give yourself than a strong, healthy body and some peace of mind! You’re right…this is 100% a process and a journey…one you have to trust and know that when you’re doing good things for yourself, good things will happen! And I totally have to point out–the “swollen” look you get in your legs after a workout–that’s your “pump”!! This happens to everyone. I tell Erik all the time that I look terrible in workout videos or pics because of that same pump…everyone is affected differently but man, I feel like my muscles get huge during and right after workouts. So that’s actually really normal and it goes down within a few hours or so. In fact, Erik once told me that a lot of guys will lift really late on a Friday or Saturday night in order to get that “bigger muscle” look before they go out!! Haha!! So don’t stress about the pump, and over time, all the muscle you’re building will help you burn fat naturally and restore your metabolism back to a healthier level. 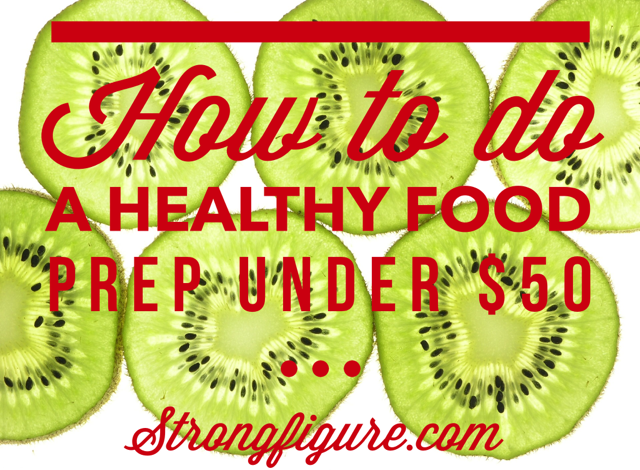 Keep making healthy food choices, treat yourself when you need a treat, and you will be just fine. 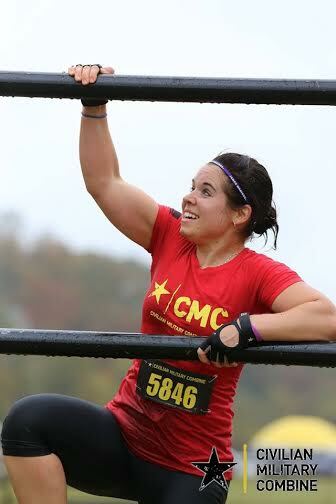 Thanks again for commenting–your post is inspiring both for me with what we’re doing here at strongfigure and for so many other women in this same situation! Good luck with your journey! 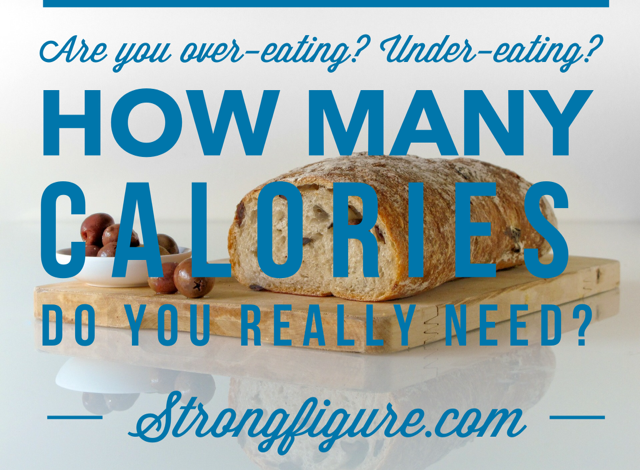 To put on muscle and gain 11 lbs, you’re going to have to eat much much more than 1200 calories. I don’t know what your workouts are like, but even if you’re only working out 3-5 hours a week, you would still need to eat 1500+ calories just to MAINTAIN your weight of 121. That means, START EATING. Here is our FAQ page…I would look this over and read some of the nutrition posts–they should be able to answer the questions you’ve listed above and point you in the right direction of what to do next: https://strongfigure.com/strongfigure-faqs/. If you still have questions about how much you need to be eating, check out my coaching page: https://strongfigure.com/nutritional-coaching/. Let’s work on getting this figured out for you!